But it's not exactly subtle. The story goes that in the 1890s, William Randolph Hearst and Joseph Pulitzer led the United States of America to war—not as generals, nor presidents nor members of congress, but as newspaper owners. Hungry for ever-more-outrageous stories, the New York World and the New York Journal exaggerated and outright-fabricated stories of trouble and rebellion in Cuba until the US military was forced to intervene. At least, that’s how the story goes. It’s a piece of history that's half-truth, half-apocryphal; a story to make Hearst or Pulitzer proud. But that anyone believes it—well, that speaks to the power wielded by the media, that people could believe a newspaper led the United States to war. Americans have by-and-large lost faith in the fourth estate, though. That’s not to say you don’t trust any writers. (Selfishly, I of course hope you trust me, at least when it comes to talking about something as relatively unimportant as video games.) But on the whole, were I to ask you if you trusted “The Media,” chances are you would say no. Too many mistakes. Too many hands caught in cookie jars. And while the stakes aren’t always as dire as the Spanish-American War, it’s nevertheless familiar. Hell, if you watched Making a Murderer over the holidays, you saw how media coverage can (fairly or unfairly) influence the criminal justice system. It’s a pervasive problem. All this to say, at first blush a game like The Westport Independent seems like a case of right place, right time. 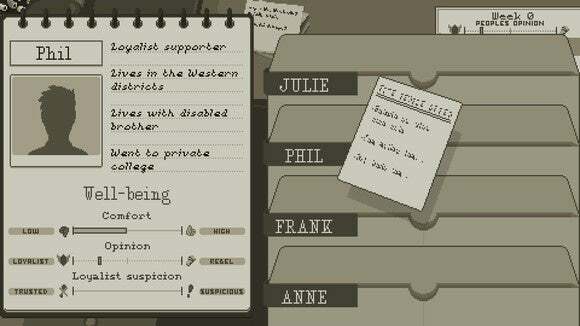 Described as a “censorship simulator,” you play the editor of an independent newspaper in an increasingly fascist country. Your job is to assign out articles to your writing staff, choosing not only what to cover but how something is covered. The headline, for instance. Click once and “Man Attacks Police Officer” is replaced with “Man Defends Teenager, Police Officer Presses Charges.” Click again and it goes back. Those headlines are very different. Those stories are very different. Once you’ve settled on a headline, you can then read through the accompanying block of text and choose to exclude certain paragraphs to bolster your point. In “Man Attacks Police Officer,” you’d probably want to leave out the part where the police officer tackled a teenager for mere graffiti. “Man Defends Teenager,” you probably want to play up the brutality. Over the course of twelve “weeks” you’ll factor in a few more aspects too, like what story gets front-page coverage, what districts of the city you want to target for increased circulation, et cetera. But it’s the constant push-pull between supporting the government and supporting the rebel factions, of telling The Truth or “The Truth” that’s at the heart of The Westport Independent. Of late, there’s been a lot of talk about “Objectivity” in journalism—whether such a thing exists, and whether it’s even important. Some go so far as to say there can be no truly objective journalism. I recommend reading Matt Taibbi’s retrospective on Jon Stewart if you find this topic at all interesting (as opposed to shamefully navel-gazing). But to summarize: Every choice a writer makes, be it diction or headline or snide joke or lede paragraph, has an impact on framing. And how they make those choices is informed by a literal lifetime of experiences. Of biases. Some people argue it’s the goal of impartiality that’s important but...well, I disagree. Full disclosure. Personally I think it’s more useful to be open and honest about my own biases when they come into play—to me, that’s the fairest way to alert readers to whether there’s a personal factor. Myst was one of my earliest video game memories, ergo I have fond feelings towards Myst. That sort of thing. The problem is The Westport Independent has all the subtlety of a brick through a window (probably thrown by a rebel sympathizer). 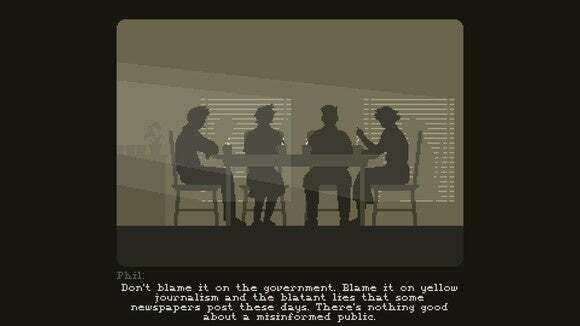 Comparisons with Lucas Pope’s Papers, Please are inevitable, given the two share the same lo-fi dictator aesthetic. But it’s another Pope project, Republia Times, next to which The Westport Independent looks most conspicuous. 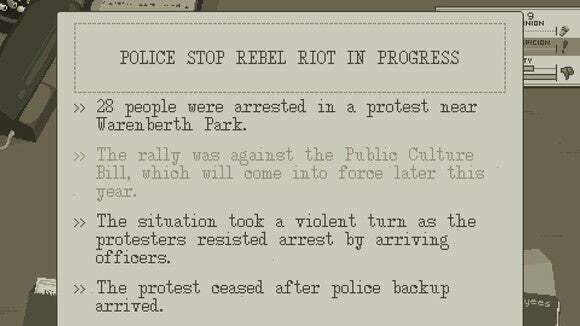 Republia Times also dealt with journalism under a dictator, although it took different form. There you were mostly concerned with where to place each story—an aspect that makes up only one small portion of The Westport Independent. In other words, The Westport Independent is like a fleshed-out version of Republia Times. And I don’t begrudge them that. Either they knew about Pope’s project beforehand or they didn’t, and it doesn’t really matter. The problem I have with The Westport Independent is it falls into a trap I typically call “Save a Baby/Eat a Baby.” It’s a pretty common issue, particularly in video games. You’re ostensibly presented with a choice, but the options are so extreme (i.e. The Obvious Good Thing and The Obvious Bad Thing) that it ends up feeling like no choice at all. Some other game examples: Knights of the Old Republic, Fallout 3, Fable, InFamous. 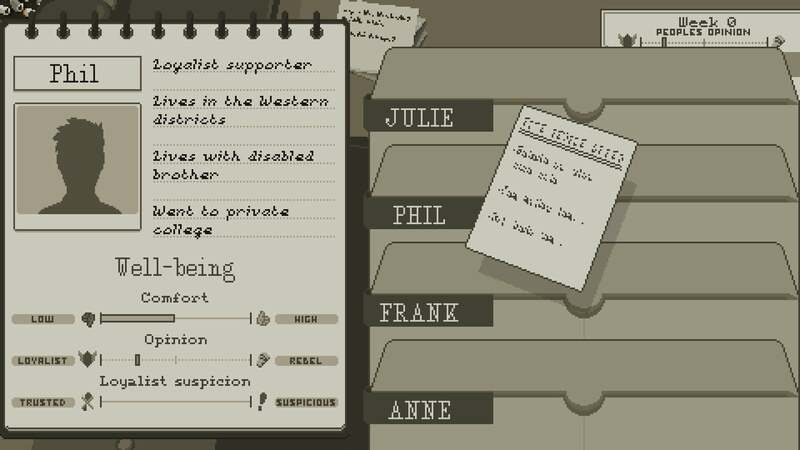 The game is short—it only took me about an hour—and I wouldn’t necessarily decry that fact were it more like Papers, Please, a game I replayed multiple times to see what else could happen. What if I’d let that woman into the country illegally with her husband? What if I’d taken money to turn away perfectly good citizens? But there’s not much room for nuance in The Westport Independent, both because of its polarizing good-guys-and-bad-guys conflict and because it ends so quickly. The journey is a fairly one-note affair, and halfway through a second run I was bored. It largely consists of “Play again, but choose the other option.” Two sides of a coin. Two extremes. Add in more than a few grammatical errors, some spelling mistakes, and a few bugs (the ending crawl described how one of my staffers both stayed at and simultaneously left the newspaper), and it’s hard to recommend The Westport Independent. Which is a shame because I think it has at least one extremely important learn-by-example thing to say about media bias, and how it can manifest in something as simple as a lie of omission. That’s a powerful message, and one it would be useful for more people to understand. To ask questions of the media, people need to understand how the media operates. 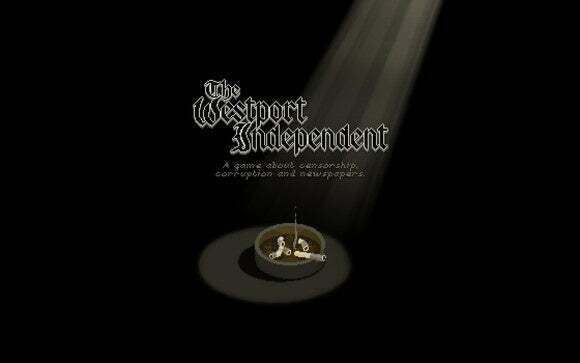 But whether The Westport Independent is worth diving into for that one kernel of truth? On that, I’m more ambivalent. 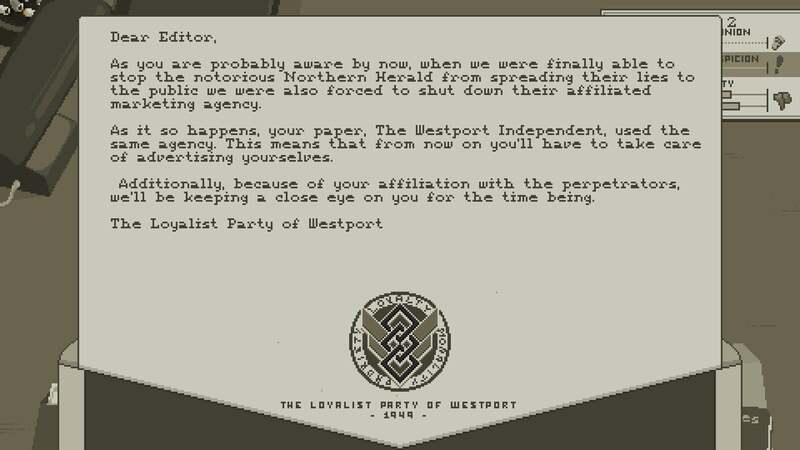 The Westport Independent has important lessons about ethics in journalism, but the game's tendency towards caricature leaves it feeling like it just barely grazed the truth of the matter.